KAA Design Group, Inc. is pleased to announce the promotion of four senior staff members to Associates. 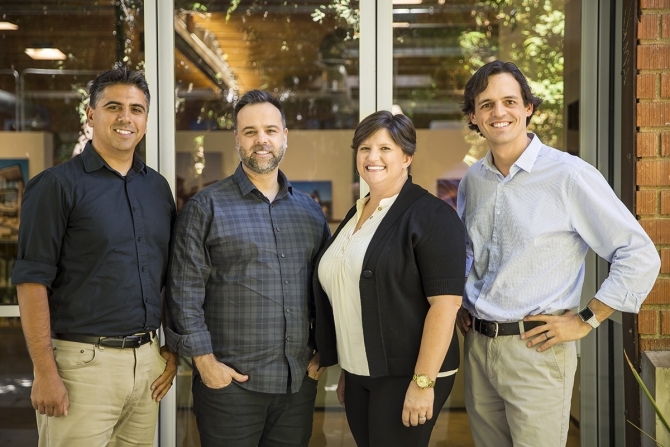 Our new Associates (left to right) are David Vazquez, Todd Paolillo, Sara Pijuan, and Matthew Paola. David earned his Bachelor of Architecture degree from the University of Southern California (USC) and Sara earned her Master of Architecture degree from USC as well. Todd graduated from the Rhode Island School of Design with a Bachelor of Architecture degree, and Matthew graduated from Tulane University with a Master of Architecture degree. In their cumulative 54 years of experience at the firm, they have helped to advance architectural design and to mentor their fellow coworkers. These dedicated individuals continue to play a vital role in KAA Design Group’s commitment to design excellence as well as project and firm management for both the KAA Design and Evens Architects studios. We are excited to acknowledge their continued success and watch their leadership grow. To learn more about this talented group, please visit our website at www.kaadesigngroup.com.